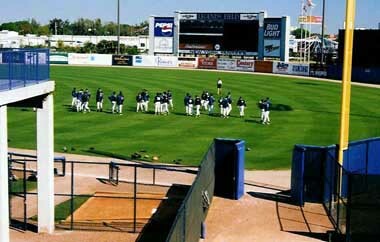 The beautiful Legends Field, located at One Steinbrenner Drive just across the street from the Bucks' Raymond James Stadium has always been one of my favorite places to catch a game in the Grapefruit League. Legends Field is a pretty new park, and it is absolutely huge. 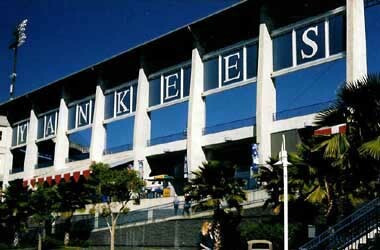 Despite the fact that it is the largest stadium in the Grapefruit League, the games sell out quickly because of their famous (or infamous) tennants, the New York Yankees. Get your tickets early, or you won't be able to catch a game. The bad thing about Legends Field is that since it is so big, I can't say that "every seat is a good one" as I often mention on other reviews. But if you really want to see the Yankees, you're probably willing to make that sacrifice. The plant life around the stadium is gorgeous. With large lakes and beautiful flowers and palm trees, the stadium grounds are extrememly visually pleasing. Another great thing about Legends Field is the concession stands. In addition to the regular hot dogs, burgers, and other usual cusine, there is Cuban food and usually a good array of desserts. Legends Field also has the largest gift store I have ever seen, due to the mass commercilization of the Yankees ball club. There must be at least 40 different styles of Yankees baseball hats for sale in the store. 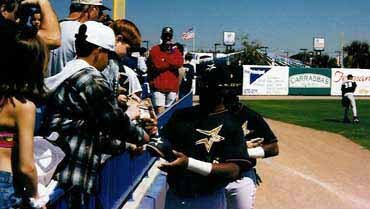 Autographs are extrememly difficult to come by at this stadium, although not entirely impossible. Usually a good day for autographs at Legends Field is two or three signatures. The ushers at Legends Field are the strictest in the league, and unfortuantely, access to players is at a minimum here. At Legends Field, there is an area that honors former Yankees greats, similar to the monument parkin the outfield of Yankee Stadium in the Bronx. Yankee legends (hence the stadium name) are honored with a sign baring their number and stats. It is a classy way to remember great players and an excellent way for fans to learn Yankee history. Sometimes near the monuments there is a big band performing, which definitely adds to the atmosphere. Despite the large, somewhat impesonal feel of the stadium, I always enjoy attending games at Legends Field. There is nothing quite like soaking in the rays in seats of beautiful Legends Field, in the sunny city of Tampa, followed by a meal at Shell's (see restaurant reviews). Legends is an attractive, clean place to see a game, and I would definitely encourage all to attend at least one game there. Ushers ban fans from standing near the dugout, so you'll need to wait near the outfield for autographs. You're also more likely to obtain an opposing player's autograph, as there is always a huge throng of Yankees fans trying to meet the home team. The beautiful banner that lets you know you're in Yankees territory. Notice the gorgeous palm trees and shrubbery. The stair case on the right leads from the entrance down to a park area that's popular for games of catch. Arrive at the stadium a few hours ahead of time and you can watch the players stretch, warm up, and take batting practice. Many fans enjoy having their pictures taken with the monuments of Mickey Mantle, Lou Gehrig, and Babe Ruth, which is pictured here. Autograph tip: If you feel you absolutely must get the Yankees signatures, there are several practice fields you might want to hit up a few hours before the game. You also might try hanging along the outfield lines to get autographs. There are so many fans, and the ushers are so strict, that you shouldn't bother for autographs here. Just enjoy the a great Yankees ballgame. It's almost impossible to get autographs here unless you visit the complex in February. Your best best is to wait at one of the four outside practice fields. Also, wait by the front office and you are sure to get The Boss to sign a few, plus some celebrities like Rudy Guilliani, Jeb Bush, and others. Also, many other star athletes visit here, including Warren Sapp and Wayne Gretzky to name a few.